Salad Days: pretty in pink pudding - chia, coconut and berries! 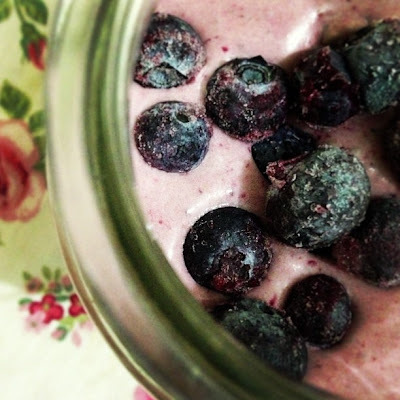 pretty in pink pudding - chia, coconut and berries! Holy crap, but it's hot in Melbourne! My poor little house is seriously melting from within, all it's inhabitants can do is loll about in front of the fan in our underwear, limbs akimbo, whinging wholeheartedly about the ridiculousness of 30degree + temperatures in AUTUMN. Perhaps my biggest complaint? The inability to make full use of my sweltering kitchen. Cooking on the stovetop? Oh boy. Turning on the oven? Not a chance. The blessing in disguise is, of course, the abundance of use my Thermomix has been getting as well as all the raw goodies I've been partaking in - delicious smoothies, juices and other treats - when it's simply a matter of bunging a few things in the blender and whizzing for a minute? Yeah...I guess I can manage that (despite my heat related apathy!). And this is precisely how my Pretty in Pink Pudding came about - to be honest, it was more of a mousse than a pudding, but I wont let facts stand in the way of an alliterative and catchy title! Like the majority of my recipes, this is a great mix and matcher - it allows for any number of substitutions in terms of the fruit used and flavours added, but so long as you keep in the chia seeds, nuts, coconut milk and protein powder, you're definitely treating yourself to a healthy and welll balanced breakfast/snack/dessert treat with a nice mix of protein, healthy fats/essential fatty acids and unrefined, wholefoods based carbohydrates - helping you fill up quicker and stay full for longer. Definitely a goodie to have chilled in the fridge for those 3pm snacky-slumpy moments that are all too common! Putting it all together is as simple as chucking it in a blender and whizzing on high. The consistency at first will be much more like a thick smoothie than a pudding/mousse. You'll need to upend it into a receptacle (I used a glass mason jar) and let it chill in the fridge for a couple of hours at least. If you like, you can top it with other goodies before serving - I whacked some hemp seeds and spirulina on mine and mixed it in (totally sabotaging the pretty pinkness of it, but, oh well), as well as some extra berries for texture. I hope you like this one! I'll be experimenting with more autumnal varieties in the future, hoping to introduce some cooler, breezier days by channeling them from my kitchen. It does look very pretty in pink! Beautiful flavours, too. Stinging Nettles: The Weed with Bite!